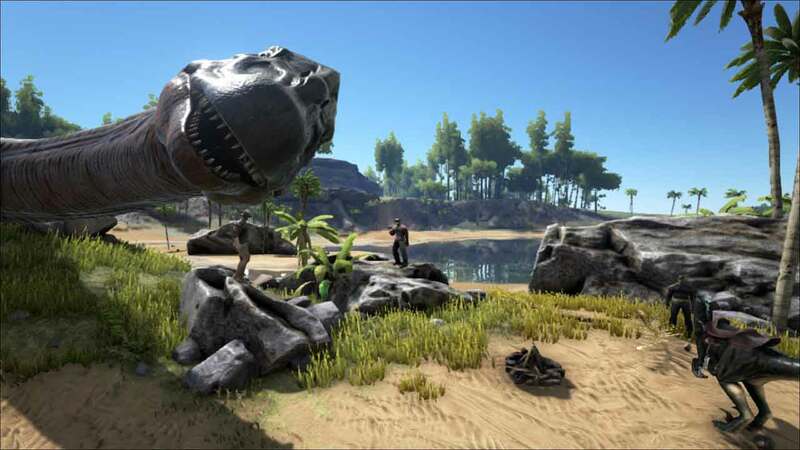 Studio Wildcard continue to impress with yet another fantastic update for the award-winning ARK: Survival Evolved as a slew of new content arrived today including 3 new dinosaurs, a new weapon and a deadly boss encounter. Stepping away from the typically terrifying inhabitants of the island the new Lystrosaurus dinosaur adds the option of a temporary buff for players, increasing experience points for petting or hugging the dinosaur – it doesn’t bite, promise. In more traditional fashion the other 2 dinosaurs include a gigantic rideable centipede, the Arthropluera, and the teeth-filled Sabertooth Salmon. The new weapon comes in the form of the Primitive Bolas, a game changer that adds yet more depth and variety to the combat approach in ARK: Survival Evolved. The snow-capped mountains of the island are now more deadly with the introduction of the Megapithecus, a brutal new boss fight against a huge ape and a seemingly endless army of monkey minions.